Easily among Trout's most beautiful and elusive rookie productions. 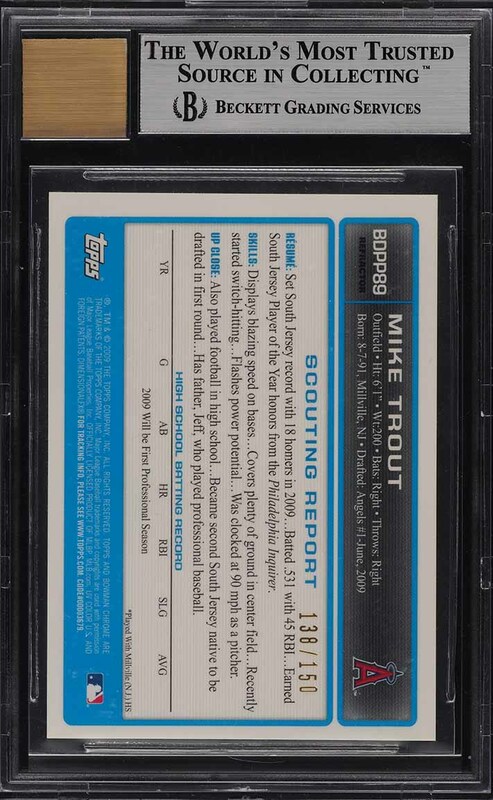 The Bowman Chrome Blue Refractor Trout is not only ultra condition sensitive, but comes from a very limited print run of just 150. It's really no wonder why very few of these cards ever surface in such high-grade. The offered specimen is shockingly beautiful and outshines most other Beckett 9 examples; in fact this card is just 0.5 away from the overall '9.5' assessment. The card possesses four untouched corners with blemish free edges around. The surfaces are spectacular with zero refractor lines, indents or scuffs present. The card boasts a vivid blue shine with precise registration throughout. A modest centering shift is the only 'flaw' that keeps from grading higher. The autograph is undeniably pristine and beautifully struck in blue ink. Trout continues to build on his elite brand with his sheer dominance in the MLB. 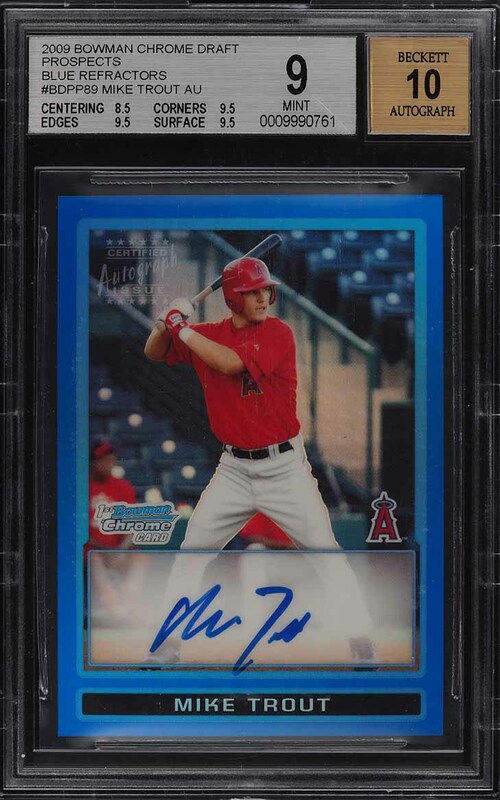 In the likely scenery that Trout continues to be the best talent in the MLB, this card seems poised to bring a high return on investment. We are extremely excited to offer this modern day beauty to the investment community, free of reserve. One of nearly 15,000 cards, lots, and sets up for bid in our 4th Auction of 2019. Click on the link above to view the other PWCC auction lots. The PWCC Vault is now live! Open a PWCC Vault account and receive a custom Vault shipping address. Purchases shipped to the Vault receive free shipping and reflect Oregon's 0% sales tax rate.